Les Restanques is a traditional stone house is situated on a south-facing hill just below the beautiful village medieval of Fayence. It is a spacious house with a large garden but still within walking distance of the village with its great restaurants and bustling traditional market. This villa has four double bedrooms all with en-suite bath or shower rooms sleeping 8 in total, the three upstairs bedrooms are fitted with air conditioning. The large, open plan living area leads to the dining section and on to a well-equipped kitchen, which then opens up onto the covered terrace. The private pool is 5m by12m with convenient steps for entry and superb views across the valley. Privacy is assured with this fully enclosed villa, access is via electric gates and there is plentiful parking, some covered. You can drive up right up the the villa if you have been shopping, the large Supermarket at the bottom of Fayence is walking distance though. 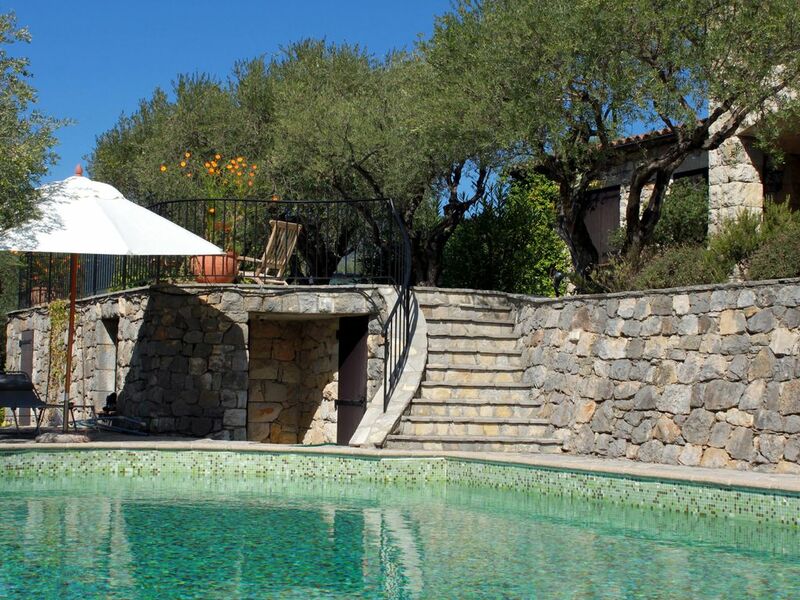 Restanques is the ideal villa for someone looking for the Provencal charm of a stone built house within walking distance of the historic village of Fayence. There is much to do in the area from swimming and boating in the fresh water lake Lac St. Cassian, trail riding, wind surfing and gliding from Europe's largest airfield in Tourrettes by Fayence. The area is fantastic for walking and close by you can visit the beautiful Gorge du Verdon the largest gorge in Europe. You can visit the local vineyards and make a trip to an olive oil mill in Callas and taste the price winning oil. The Mediterranean is not far away with places like Cannes, St. Tropez and their fantastic beaches. For music lovers, there are plenty of summer concerts with jazz in the open air in Bargemon and in nearby villages of Seillans and Montferrat; chamber music and recitals in nearby churches: Mass with Gregorian plainsong on Sunday mornings at the Abbey de Thoronet; opera in Aix-en Provence, Orange and Nice. The village : Villa Les Restanques lies within 10 minutes drive of freshwater lake St Cassien and overlooks the upmarket village of Fayence. Located less than 15 minutes from Autoroute A8 Exit 39, it is ideally placed for trips to both Provence and the Luberon to the west and Cannes and Monaco on the French Riviera to the east. Nearby there are a large number of restaurants, some with Michelin stars, as well as a number of supermarkets. A championship golf-course, Terre Blanche, is 10 minutes drive away. All the other major French Riviera attractions are within 30-45 minutes drive. Fayence has a typical open market three times a week. This is where the local meet and shop their vegetables and meats from the local farmers. The market also offers other typical Provençal products and gift items. All bedrooms have en-suite shower or bathrooms. There is also a showroom with toilet by the pool. Large grounds with space for children to play. Plenty of parking. Property enclosed and with automatic iron gate. Walking distance to the village. The location of the property is fantastic - you can walk up into the village or down to the supermarkets within minutes yet the grounds are large, private and very well kept. The outside areas are stunning - the pool is wonderful and was very welcome in the extremely hot weather, as were the air conditioned bedrooms. The en-suites are showers and sinks with one WC upstairs, one downstairs and one by the pool. The villa is extremely well equipped with huge BBQ, outdoor seating and eating areas, covered car port and gardens. The village itself has local markets, wonderful restaurants, only 45 minutes from the coast, nearby beautiful villages and we could not have asked for more. Christine and Ian did everything they could to make our stay so relaxing and were very welcoming hosts. We would definitely recommend this property. Fayence is one of five perched villages in the Canton de Fayence. Each of these is worth a visit with their old cobblestone narrow streets, their fantastic views over the valley and toward the mountains. The area offers something for everybody from mountaineering, to white water rafting in the Gorge du Verdon, canoeing or paddle boating on the lake St. Cassian, golf on the Terrace Blance in Tourrettes or even visits to the nearby beaches of Cannes and Frejus. Enjoy the good restaurants; visit the local wine yards, shop at the local vegetable markets. The area offers restaurants from the simple local food to two star Michelin restaurants. If you enjoy music the villages offer music festivals over the summer months everything from opera to jazz. Finally we are so close to places like St. Tropez, Monaco and Antibes places that are all worth a visit. Golf: If you are interested in golf there are plenty of possibilities within an hours drive but the closest is the famous Terre Blance golf in Tourrettes by Fayence, which offers two 18 hole courses. This is a five star establishment. Ski: There are also many possibilities for skiing. Just north of Fayence and only one hours drive you will find the first hills but if you require alpine skiing you will find the Alps only 2 hours drive north of Nice. Fantastic skiing and beautiful area. Long term rentals welcome, price depending on period, please ask. Utilities not included in long term rentals or rentals in low season Rates include linen, towels, pool towels. Final cleaning and change of linen every week.